From September 16 till September 25, Amsterdam organizes the famous Unseen Photo Fair & Festival. Refugee Start Force is invited to participate and together with a great group of partners, we will help to organize ‘Studio Aleppo’. We want to show the world the real faces of refugees and show that we are actually all the same. We are looking for volunteers who like to help us and who like to have their picture taken (no costs, travel costs will be reimbursed) and be part of the photo gallery. The location of the exhibition is at a very nice building at Keizersgracht called Felix Merites (see picture)! Studio Aleppo encourages encounters and contributes to a positive change in the perception of refugees and locals (we want to give refugees a good face). 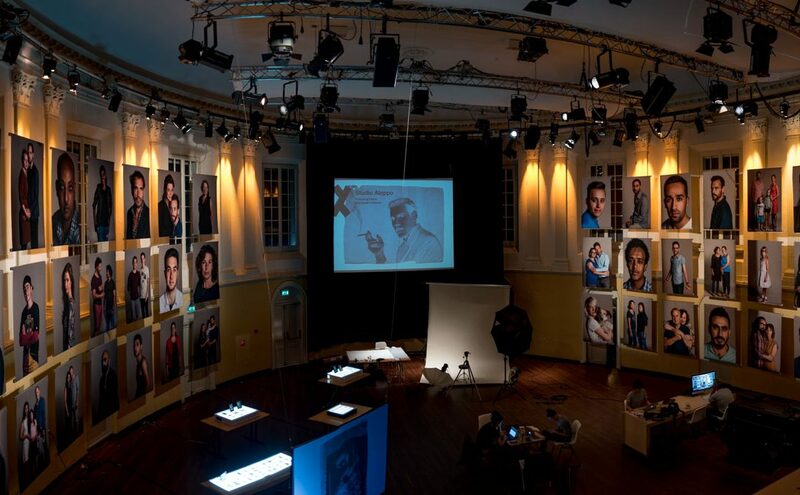 17 + 18 September, 11:00 – 17:00, Felix Meritis will be the location of the portrait studio of the famous photographer Koos Breukel (http://koosbreukel.com). ‘Old’ and ‘new’ Amsterdam residents (and families) will be portrayed in the studio and interviewed. Statements of all participants will be gathered by asking short questions. Their statements are the starting point for a conversation with other citizens portrayed. The photos will be printed in poster size on site by Canon and will form a monumental portrait gallery that will be on show during Unseen at Felix Meritis. The portraits and statements will also be published on www.studioaleppo.eu. Contributions from all portrait studios in other places in Europe will be added over time. Part of the exhibition is a selection of found prints and negatives from a demolished photo studio in Aleppo, found by Syrian photographer Issa Touma and the incentive for this project. During the exhibition, you are very welcome to come to the exhibition any time, meet Dutch people and show the Dutch who you are! At the last day of the exhibition all people who helped to organize this project will come together and together with all refugees who helped us, we wil celebrate the success. Register here: www.studioaleppo.eu (from 2 September) or send an email to Hannah Hagen (hh@paradox.nl). – your own portait (with your family) by renowned photographer Koos Breukel and a portrait of a newcomer. You’ll receive a small print of your portrait. – an invitation to the exclusive Studio Aleppo finissage on 25 September. Note: All participants in the studio sessions agree with the publication of their portrait and statement on the website and possibly as part of a media campagne, street campagne and exhibition. Studio Aleppo is an initiative of Paradox, carried out in collaboration with Felix in de Steigers, Streets of the World, De Asielzoekmachine, ISSA TOUMA / Art & News Page / Art Camping, Z_lab, Ondertussen in de Spaarndammerbuurt and Refugee Start Force (www.refugeestartforce.eu). Supported by Canon and VluchtelingenWerk Nederland.